Smaller kitchens without room for an island can be somewhat limited in terms of what they can include; every kitchen needs all the basic appliances, room to store dishes, cutlery, pots and pans, and cooking utensils, and enough counterspace to store any number of gadgets and still leave enough room to work. If you’re fortunate enough to have a larger kitchen with room for an island, or even a peninsula, all those basics are probably already covered before you even get into the island’s design. So why not incorporate one or two kitchen island ideas that go beyond the ordinary, and truly personalize your kitchen, not just in form, but in function, too? 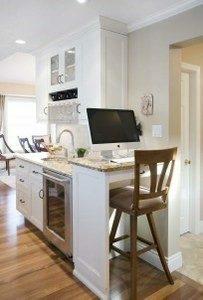 Does Your Laptop Live on Your Kitchen Table? You’d be surprised how many people wind up with their laptops living on their kitchen table, even with a perfectly good home office just down the hall. If that sounds like you, why not embrace the idea, and build a computer workstation into your island? With just a few extra pieces from the RTA Cabinet Store, you can build in an elevated computer desk so you can be sure no spills ever reach your electronics. Add in a bar-height office chair and either a dedicated computer or a laptop docking station, and voila! Room for your computer to live in the kitchen, and a kitchen table that’s always clear for eating or socializing! Also easily achievable with a few modifications, this workstation can just as easily become a bookshelf to store cookbooks or games. If you love wine, you’re probably familiar with this common conundrum: how do you keep your beloved wine collection out on display, but also at the proper temperature for enjoying the wine itself? The solution is the wine refrigerator, and it’s easy to build one into the end of your island. You can even build it into the end away from the rest of the kitchen, which faces your dinette or the doors to your deck or patio, so you don’t take up any valuable kitchen-accessible storage space. Do You Anticipate People with Different Needs Using Your Kitchen? Most kitchen countertops are about 30 to 36 inches tall. That’s just fine for average-sized people who can stand up to cook, but an island is a great place to incorporate sections for people with other needs. A table-height portion, for example, can be useful for children or other “vertically challenged” people, as well as those in wheelchairs or who need to be able to sit down to cook for long periods. Then another section at the height of a typical bar, say 48” or more, will form a great workspace for people over six feet tall, for whom normal countertops mean a constant slight bend as they work at waist height. This kind of variable height island is easy to achieve with RTA cabinets, and can be seamlessly incorporated with either of the other ideas we’ve presented here. Need more kitchen design ideas? Our free e-book, The Consumer’s Guide to Kitchen Cabinets comes with two bonus guides: Our Top Twelve Most Popular Design Ideas, and The Kitchen Remodel Survival Guide. Along with the main book, you’ll be able to identify common pitfalls and mistakes, avoid getting ripped off, save money on restaurant bills as your kitchen is out of commission for a weekend or two, and get great ideas to include in your kitchen remodel. Download them today!